Have you ever wanted to live in the lap of luxury for doing absolutely nothing? Click here to play! Well, now is your chance, as this colorful online slot will see you showered with money and gifts without having to lift a finger. Stick close to the Sugar Mama, as she is your main source of income in this game. She’s a bodacious blonde that will payout up to 1,500 times your line bet. You’ll also want to deck yourself out with essential accessories to fit into your new lifestyle. Spin in three or more little Chihuahuas and pick up a payout worth up to 1000 times your line bet. There are also credit cards and handsome waiters adorning these reels. The former picks up a top payout worth 750 times your line bet while the latter will get you up to 500. 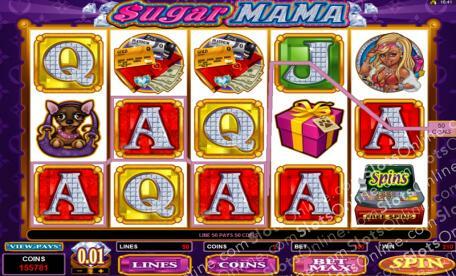 Though, the Sugar Mama logo is the highest paying symbol in this game as it will award up to 7500 times your line bet if you can spin in three or more. There are also a couple of bonus symbols available in this game that will help you live the high life. The first is the present symbol. It’s a scatter and two or more to multiply your total bet. Three or more will trigger the Boutique Bonus where you can win even more in cash and prizes. You’ll also want to watch out for the register symbol. Two or more of these will trigger a number of free spins with a multiplier on all payouts. There’s plenty to be had when you’re living it up with the Sugar Mama! The pink present is a scatter symbol. Spin two or more anywhere on the board to multiply your total bet by 1, 2, 10, 100 respectively. It will also trigger a bonus game. The Sugar Mama logo is a wild symbol. It will replace most others (excludes bonus and scatter symbols) to help you create more wins. It also pays out up to 7500 times your line bet. Three or more pink presents anywhere on the board trigger the Boutique Bonus round. You will get to choose three presents to reveal your bonus payouts. Win up to 60x your total triggering bet.